A Trolls birthday party is a great choice for anyone who can appreciate a colorful, cheerful, and happy party scene. Recreate the magic of Troll Village with 21 inspiring Trolls birthday party ideas sure to result in lots of smiles, hugs, and giggles. Even the grumpy Trolls cake idea featuring Branch will bring a smile to your face. Get ideas for party crafts like the puffy paint rainbow craft, and inspiration for DIYing your own Trolls birthday party décor as seen in the tutorial for Trolls paper lanterns. Don’t miss out on these 50 great kids party games. Having the party outside, check out these outdoor party games. 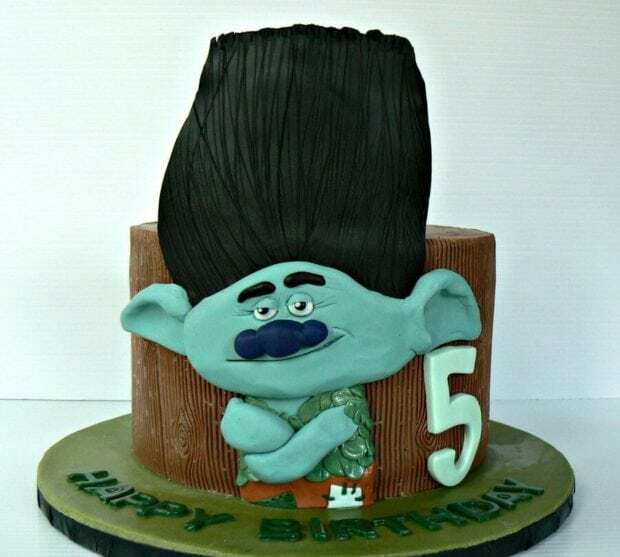 Your Trolls-loving birthday boy will flip over this grumpy Trolls cake featuring Branch! While Branch may always be prepping for the worst, you’ll want to prepare for the best Trolls birthday party ever, which definitely needs this cake! Check out the fondant detailing! This cake would be perfect for your boy’s Trolls birthday party! If the world, according to Trolls’ Princess Poppy, is made of cupcakes and rainbows, then your Trolls birthday party should be too! Here is an easy popcorn upgrade that brings the vibrant colors of the rainbow to your Trolls themed party table! The best part is that the recipe is kid-friendly! 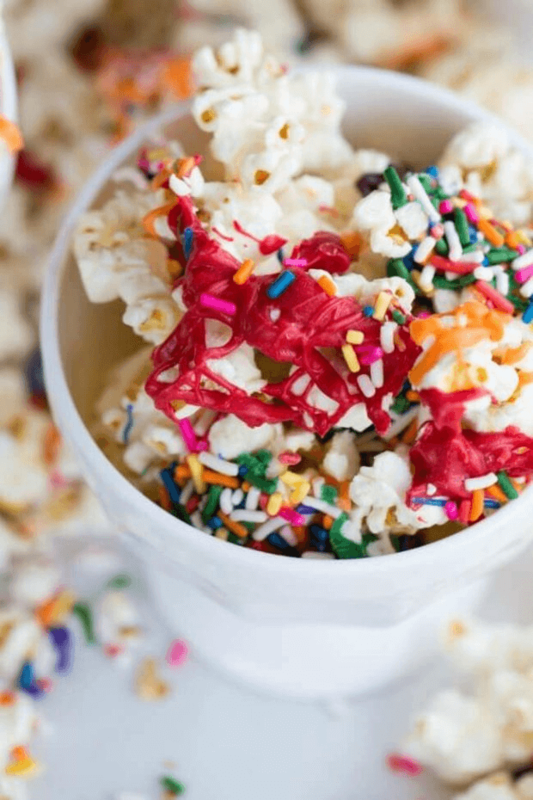 In addition to popcorn, you’ll need melting chocolates in each rainbow color and sprinkles! The prep is simple and outlined in the recipe instructions. Edible party favors are always on trend and make for a popular party favor! 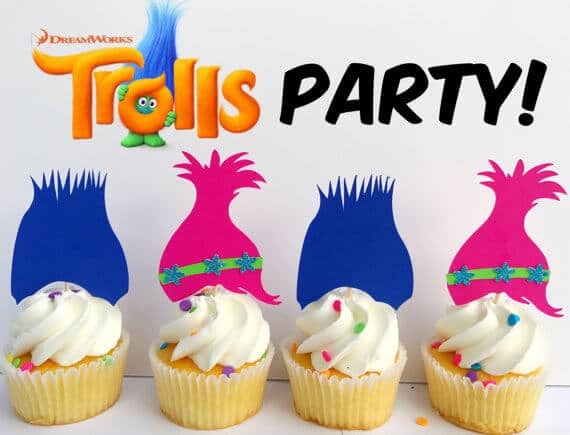 A Trolls birthday party favor idea that centers on the iconic Troll hair is genius! 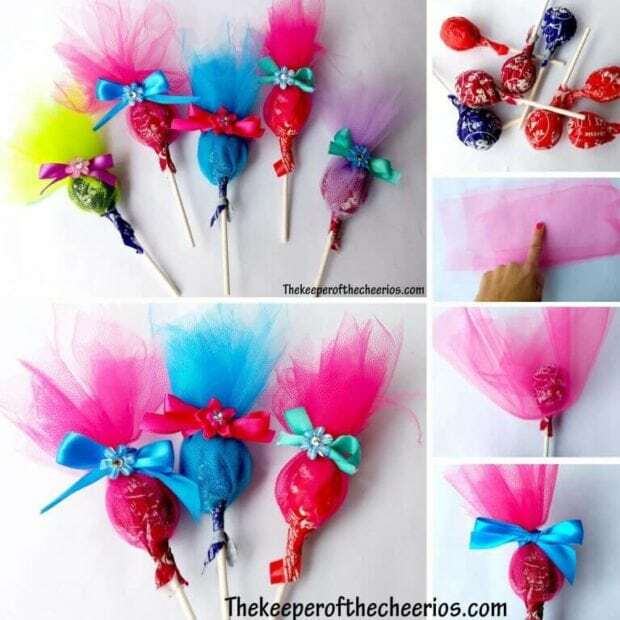 This Troll hair cotton candy favor idea is easy to assemble! 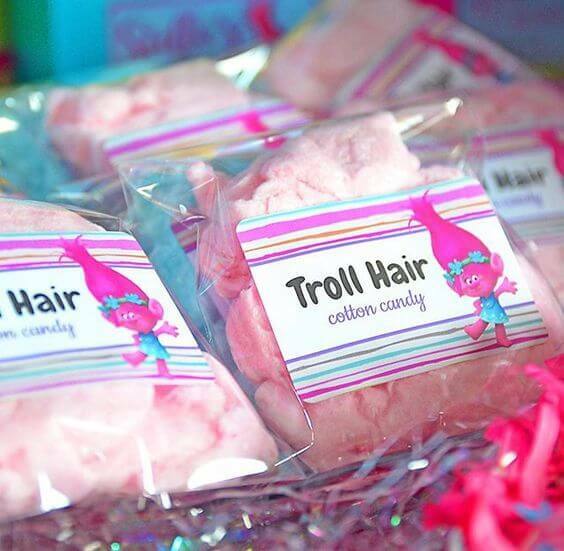 Fill a Ziploc bag with cotton candy to represent the Troll hair, and add a colorful, personalized printable label! Ordinary cotton candy is now Troll hair! Birthday parties are only as fun as the crafts, games, and activities you organize. Trolls birthday party guests will enjoy using puffy paint to create their own rainbow craft projects to take home with them. 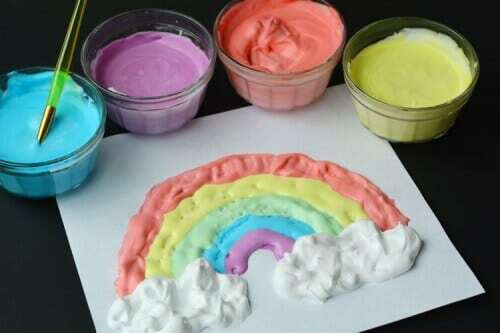 The puffy paint is simple to make and only requires three ingredients—shaving cream, white school glue, and food coloring. You and your party guests will be obsessed with the cool texture of the puffy paint when it dries! 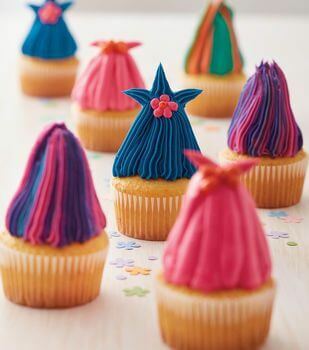 Add some pizzazz to your Trolls party birthday cupcakes! Your party guests will instantly recognize the hair of Poppy and Branch from the movie! These toppers are handmade using cardstock and adhesive. They can easily be inserted into your cupcake using the attached toothpick! 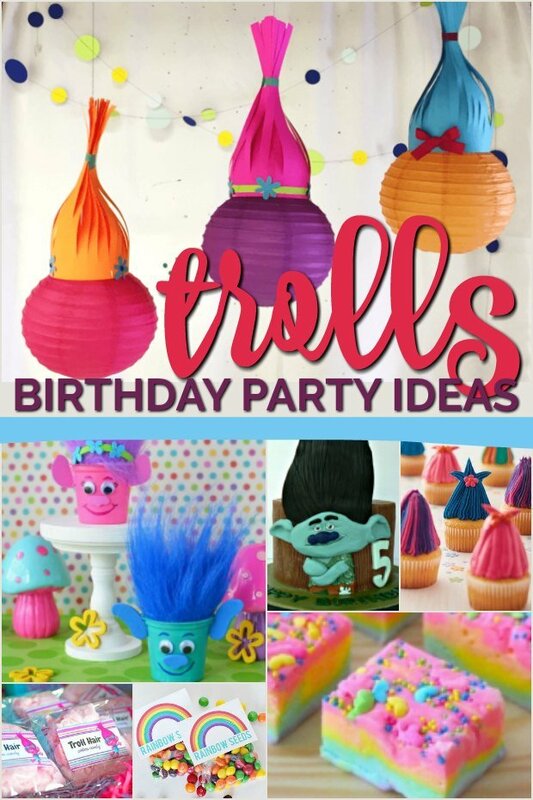 There are so many creative decoration ideas for a Trolls birthday party! 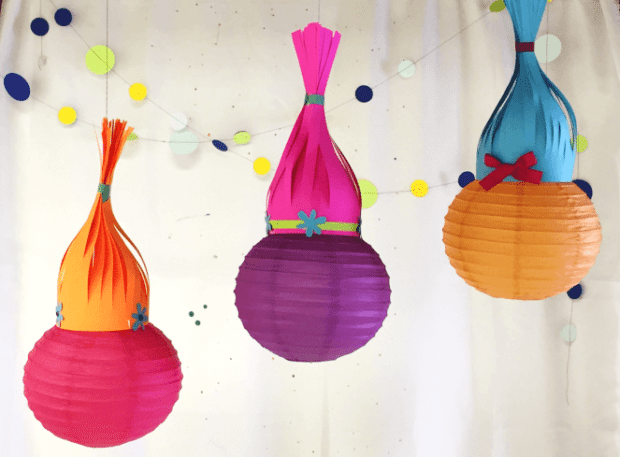 Check out this tutorial for crafting your own Trolls paper lanterns! How cute is that paper hair? To recreate this look, you’ll need the following supplies: paper lanterns, colorful paper for the hair, ruler, tape, paper trimmer, pencil, thread, washi tape. The step-by-step instructions in this tutorial will walk you through the simple process for DIYing your own Trolls paper lantern party decorations. Set a Trolls birthday party table that is bound to result in lots of hugs and plenty of happiness! Using paper and embellishments, plus a little creativity, you can turn ordinary party store plates into Trolls inspired place settings. Poppy and Branch’s hairdos will be instantly recognizable. Party guests will love filling these plates with their party refreshments. When it comes to throwing a successful Trolls birthday party, incorporating plenty of colorful treats is a must! Popcorn is a party staple, but this idea for cotton candy popcorn kicks plain old popcorn up about a dozen notches on the cool scale. 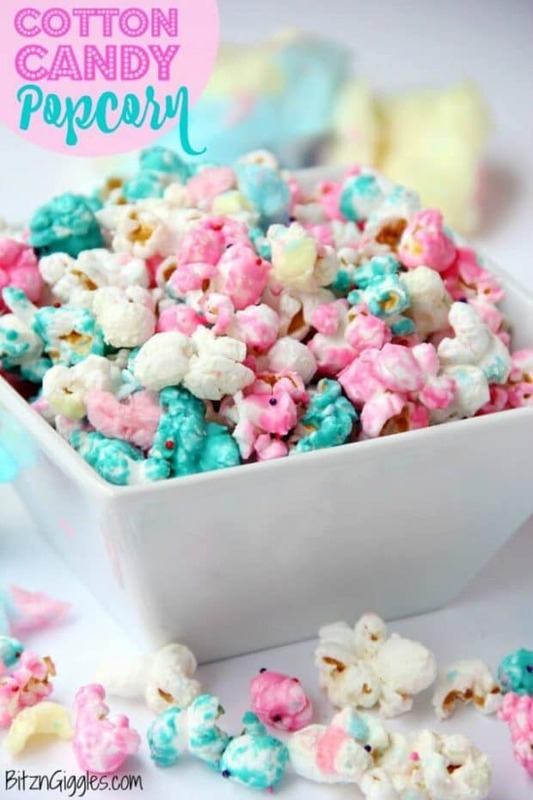 You can make your own colorful cotton candy popcorn using real cotton candy pieces, colored candy melts, marshmallows, popcorn, and sprinkles. Add it to your Trolls themed dessert table, and watch it vanish before your eyes! 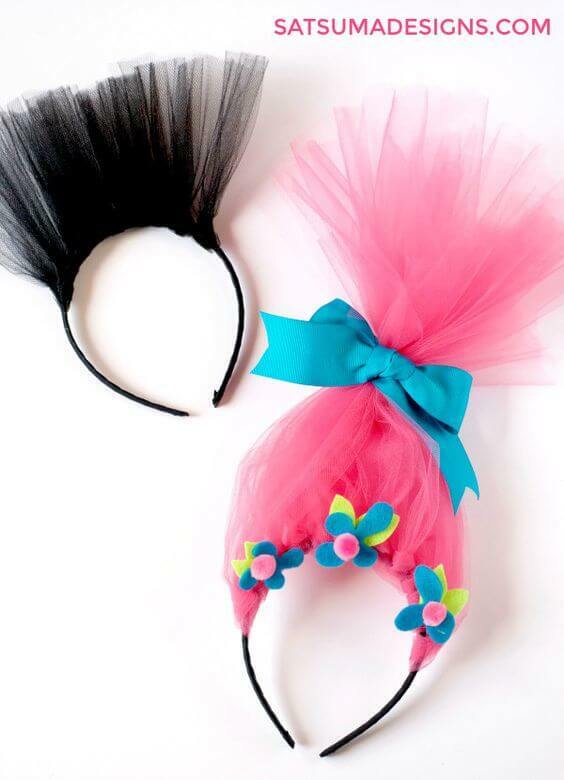 Party guests that enjoy dressing up will love these handmade Branch Trolls hair inspired headbands. Soft felt is used to create the hair, which is machine embroidered. The headband is covered in satin and is sized to fit children and most adults. What a fun accessory to wear during the party and take home as a party favor when the singing, hugging, and celebrating has concluded. Everyone loves a great party favor, but one that is crafted from a recycled item is even better, right? 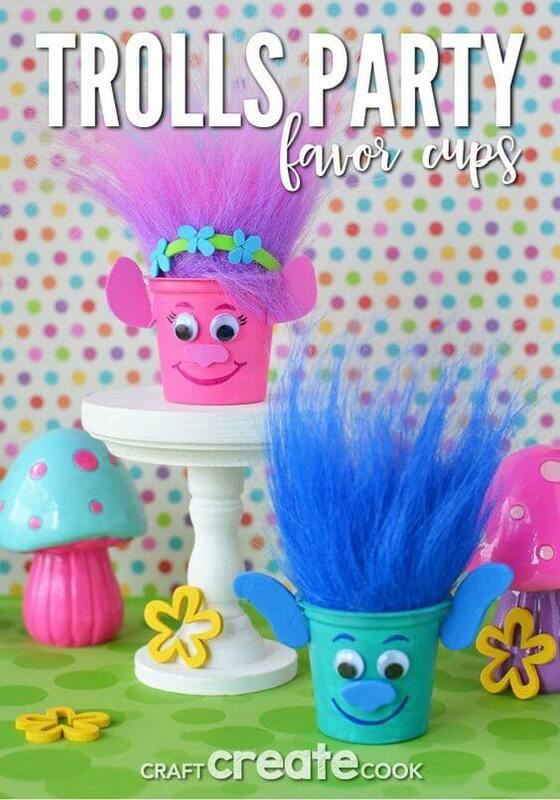 These Trolls party favor cups are made from upcycled K-Cups (coffee and filter removed, of course)! 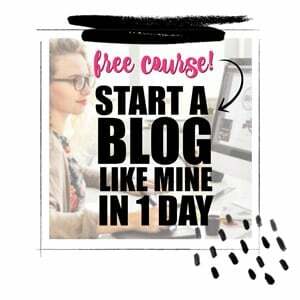 Additionally, you’ll need some other basic craft supplies: teal and acrylic paint, pink and blue fur, foam sheets, adhesive google eyes, markers, hot glue & glue gun, paint brush, scissors, cellophane bags and rainbow candies. Follow the simple picture tutorial and craft up your own fantastic Trolls birthday party favors. Party guests will have so much fun putting these adorable Poppy and Branch Trolls envelope puppets together. Plus, the finished puppets will provide hours of creative play time! You’ll love how simple and affordable this craft project is—perfect for a Trolls birthday party activity. 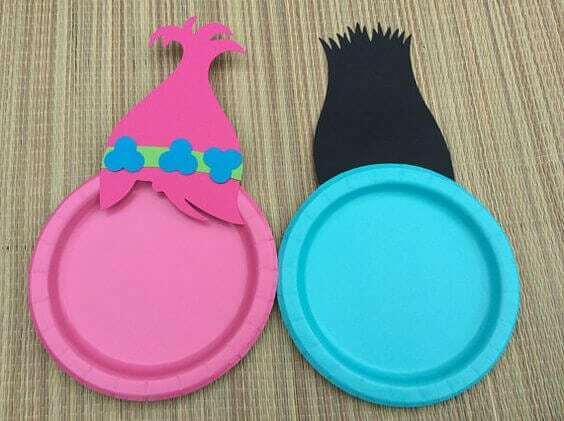 On the hunt for a great Trolls birthday themed party craft? 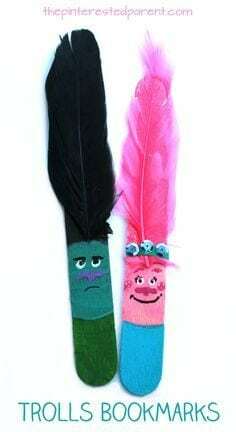 A house-full of Trolls lovers will enjoy crafting these easy-to-make Trolls bookmarks. Because they are made using Popsicle sticks and feathers, party guests can make one or all of their favorite characters. Assemble a small box of acrylic paint, glue, pencils, permanent markers, and embellishments like sequins for this project! 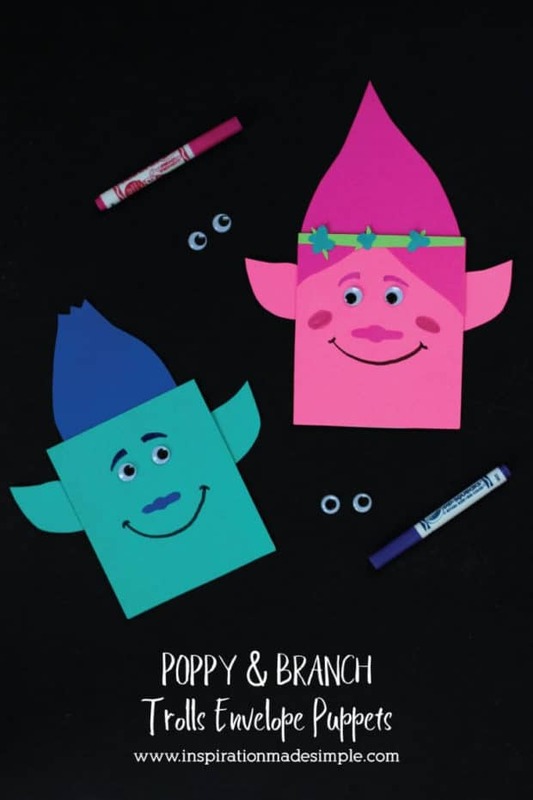 DIY your own one-of-a-kind Trolls inspired party bags featuring Poppy and Branch! This video tutorial includes the materials list, suggested sources, and full instructions on making these adorable bags! Your guests will love taking home party favors in these handmade bags. 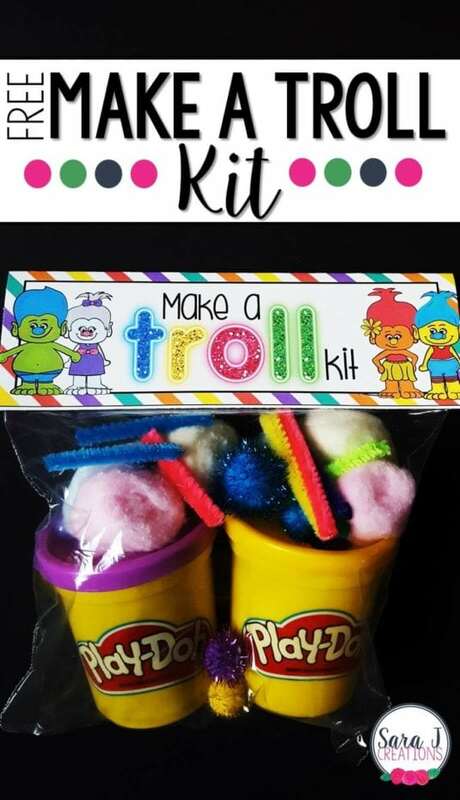 Use the free printable “Make a Troll Kit” labels to assemble favors for your next Trolls birthday party. Kids will get a kick out of being able to create their own trolls using Play-doh and a variety of craft supplies. Assembling the bags is simple using the included supply list. 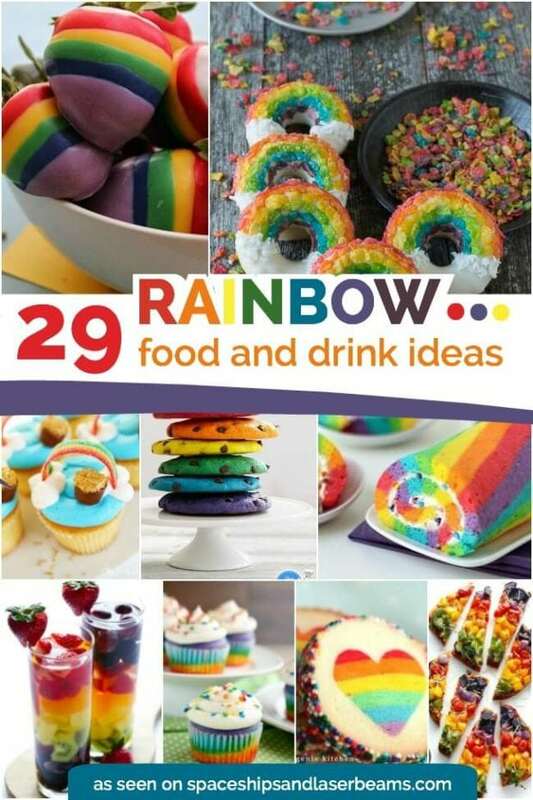 You can never have too many rainbow treats at a Trolls birthday party. This rainbow fudge has white chocolate chips, butter, sugar, half & half, and marshmallow crème as the base. Each layer of fudge is individually dyed using food coloring prior to being poured into a baking dish to set. The top is finished off with a scattering of sprinkles! Perfection! Send your Trolls party guests home with their own little bag of “rainbow seeds”. Creating this party favor is easy! Simply fill plastic bags with vibrantly colored candy in the all the colors of the rainbow. 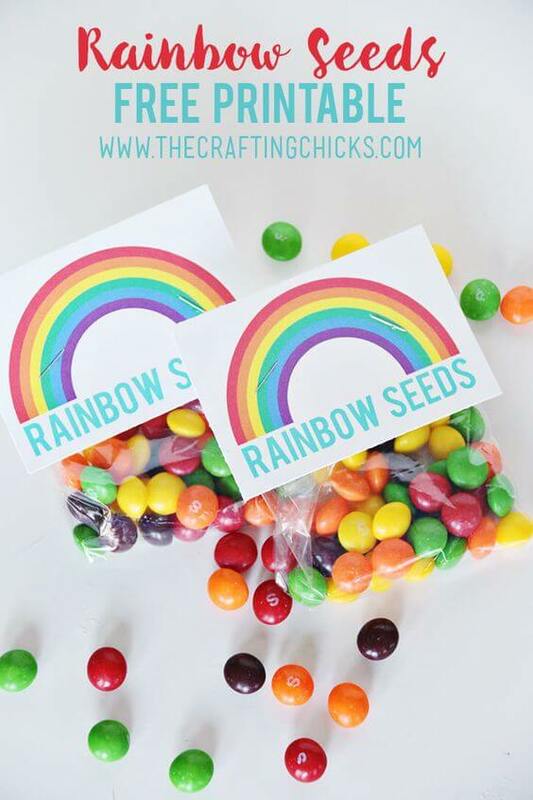 Print off copies of the free printable “rainbow seeds” labels, and attach them to your bags of candy using a stapler. These crazy haired cupcakes will definitely stand out on your Trolls birthday party dessert table! The hair is totally edible, as it is made from frosting! You can check out the tutorial for a list of supplies and tools you will need to make these awesome cupcakes, and follow the directions for crazy haired cupcake success! Customize the hair color using food coloring to match your guest of honor’s favorite Trolls! Sometimes the most genius party favor and treat ideas are the easiest! You can whip up a bunch of these Trolls suckers in a matter of minutes! Grab some tulle, ribbon, small flower embellishments, suckers, scissors, and glue to get started! Adorable and sweet too, the party guests will love receiving these and/or making them! 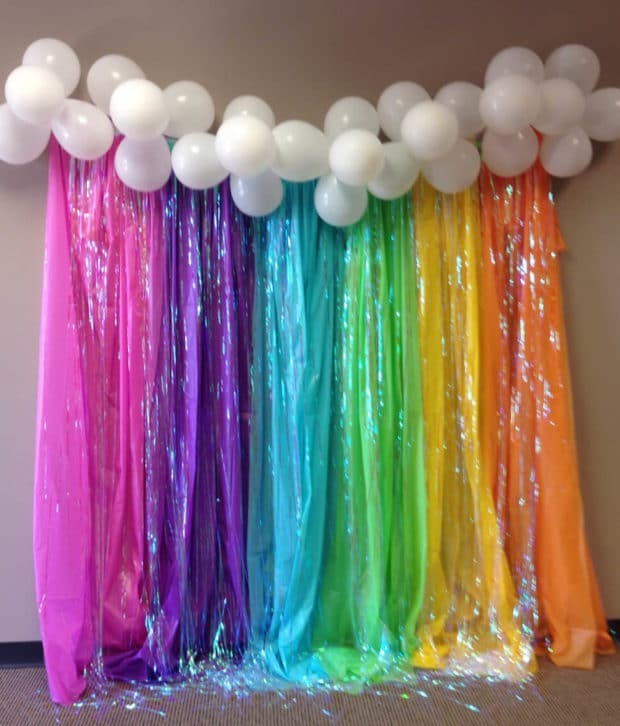 Set the scene for a fun-filled Trolls birthday party with a rainbow inspired party backdrop! You can create this colorful backdrop on a budget and in just a few minutes! You’ll need 5 plastic tablecloths in rainbow colors from your local dollar store, and white balloons to create the clouds on the top of the backdrop. 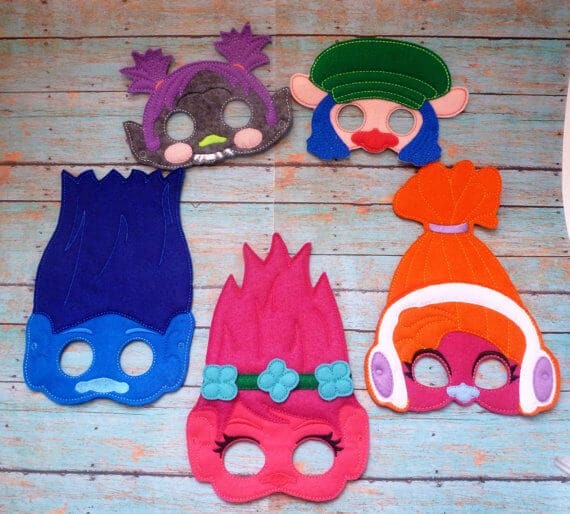 These Trolls party masks will make your child’s Trolls birthday party dreams come true! 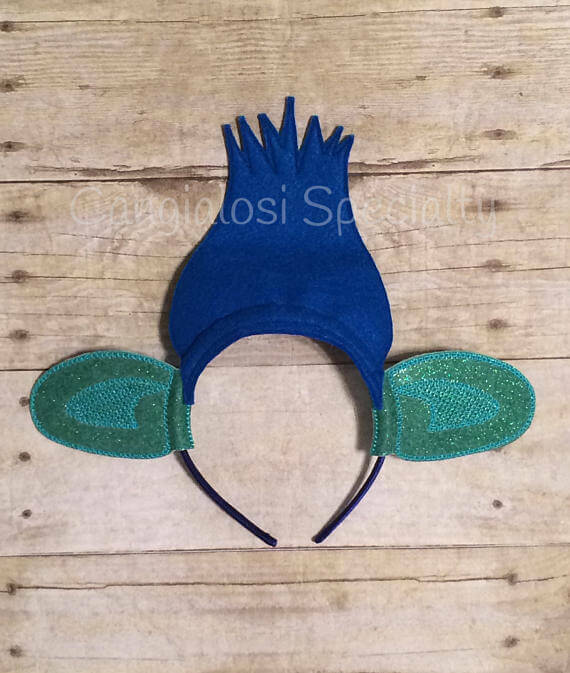 Made from felt, these masks are handmade and attached with elastic that can be adjusted as needed to fit your child’s head. 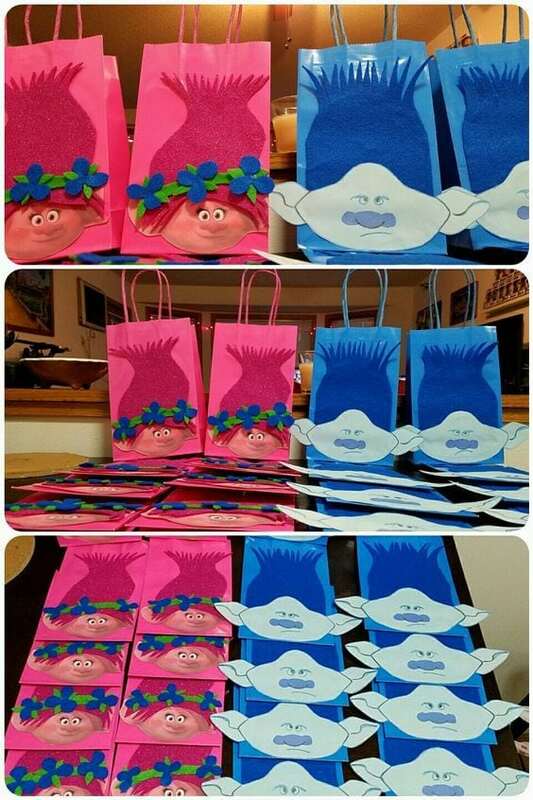 They are perfect for helping children get into character for a Trolls birthday party and make fabulous party favors. If you’ve seen the Trolls movie, you’re no doubt in love with it! Bring the magic of the movie to life in your own living room with this DIY Trolls hair. You and/or your guests can make it yourselves using just a few affordable supplies: headbands, tulle, scrap felt, ribbon, hot glue, and scissors. Check out the helpful video tutorial to learn how to make this must-have for your guest of honor and his/her Trolls party friends. Plan your own awesome Trolls themed party with these great sources gathered by the crew at Spaceships and Laser Beams. Check out more great movie themed party ideas.